of the Azzurri at the 1970 World Cup final. After defeating West Germany in an extra time classic (4-3), Italy faced arguably one of the best national teams ever assembled. Carlos Alberto, Gerson, Jairzinho, Pele’, Tostao, and Rivelino were names known to every schoolboy around the world. Brazil scored first on a header by Pele’. Italy equalized after an errant back heel by Clodoaldo gifted the goal to Roberto Boninsegna. 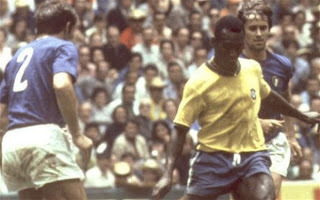 Then Brasil gave a second-half clinic with goals by Gerson, Jairzinho, and a classic strike by Carlos Alberto who was lead perfectly by Pele’. Becoming the first country to win the Jules Rimet Cup three times, Brazil retired the trophy at Estadio Azteca in a masterclass. “Rivelino crossed a high ball over the heads of the Italian defense, and I jumped higher than the defender, and headed the goal over the fingertips of Albertosi… Twenty-one minutes into the second half, with the defense bottling up Jairzinho and me, they allowed Gerson to come through the center from midfield and boot a powerful kick past a surprised Albertosi. From that point on there was no doubt what the final result would be. Source: My Life and the Beautiful Game by Pele’ and Robert Fish; Pages 278-279. Felix, Brito, Piazza, Carlos Alberto, Clodoaldo, Gerson, Pele', Jairzinho, Tostao, Rivellino. Goals: Pele’ 18′, Gerson 66′, Jairzinho 71′, and Carlos Alberto 86′. Albertosi, Rosato, Burgnich, Facchetti, Cera, Bertini, De Sisti, Riva, Domenghini, Mazzola, Boninsegna. Lineups courtesy of World-Cup History.com. Argentina, Brazil, and Italy were drawn into a second round “Group of Death.” Brazil and Italy defeated Argentina, respectively; however, Brazil had the better goal difference. They only needed a draw to advance to the semi-final round. The atmosphere at the Sarria (also known as the “Candy Box”) was electric and full of anticipation. Both sides did not disappoint in one of the most memorable games of the modern World Cup. Many pundits did not give Italy a chance; however, Paolo Rossi, the formerly disgraced striker who had just returned from a two-year betting scandal ban, had a game for the ages. Rossi, who became known as “Pablito” for his Spanish exploits, scored early in the game on a header to give the Azzurri the lead. Shortly thereafter, Socrates (a medical doctor off the pitch) beat Dino Zoff to the near post with an excellent finish. Then, after a defensive lapse, Rossi struck again with a shot into the corner past Valdir Peres. Italy went into the half with the lead, 2-1. In the second half, the Brazilians pressured for the equalizer which finally came by Roberto Falcao, who played his club side football for AS Roma. He took a ball at the top of the box, went to his left, and fired a shot past a sprawling Dino Zoff. Even though a draw would have eliminated the Italians, the Brazilians continued to press forward. Zoff made several key saves, and then in the 74th minute, Rossi shot an arrow through the heart of the Brazilian supporters. After a deflection by Marco Tardelli from a corner kick, Rossi flicked the ball past Valdir Peres, who in a very sporting gesture, retrieved the ball from the back of the net, smiled, and handed it to him. Giancarlo Antognoni, the elegant Fiorentina playmaker, scored what appeared to be the fourth Italian goal late in the game; however, he was ruled offside. “He had been very good alongside Roberto Bettega at the 1978 World Cup, but Bettega wasn’t there anymore. Rossi was the only one left, and I can honestly say that if I’d had another alternative I wouldn’t have called him up. It was a huge risk gambling on him being able to get into the rhythm of such a demanding tournament and on his desire to make up for past mistakes. But I needed a goalscorer, someone to poach for goals in the box in a way that suited the style of play I wanted. I knew that if I didn’t take him, I wouldn’t have a player capable of causing trouble in the area, a crucial role in any team." Source: FIFA.com: Paolo Rossi, I Was There. Valdir Peres, Leandro, Oscar, Luisinho, Junior, Cerezo, Socrates, Eder, Falcao, Serginho, Zico. Goals: Socrates 12′ and Falcao 68′. Zoff, Cabrini, Scirea, Gentile, Collovati, Antognoni, Oriali, Tardelli, Conti, Graziani, Rossi. Goals: Rossi 5′, 25, and 74′. 17 July 1994: Rose Bowl, Pasedena, California: World Cup Final: Brazil 0 - Italy 0 AET (Brazil won the penalty kick shoot-out, 3-2). In a very disappointing game played by two teams seemingly afraid to lose, Brazil won their fourth World Cup. Neither team created many chances, and Robert Baggio of Italy played the entire game with a visibly taped hamstring injury. But he would become the protagonist for another reason. He missed his last spot kick in an Azzurri shirt as Brazil won the only World Cup final ever decided on penalties, 3-2. “As for the penalty, I don’t want to brag but I’ve only ever missed a couple of penalties in my career. And they were because the goalkeeper saved them not because I shot wide. That’s just so you understand that there is no easy explanation for what happened at Pasadena. When I went up to the spot I was pretty lucid, as much as one can be in that kind of situation. I knew Taffarel always dived so I decided to shoot for the middle, about halfway up, so he couldn’t get it with his feet. It was an intelligent decision because Taffarel did go to his left, and he would never have got to the shot I planned. Unfortunately, and I don’t know how, the ball went up three metres and flew over the crossbar. As for taking the penalty in the first place, I was knackered, but I was the team’s penalty taker. I’ve never run away from my responsibilities. Only those who have the courage to take a penalty miss them. I failed that time. Period. And it affected me for years. It was the worst moment of my career. I still dream about it. If I could erase a moment from my career, it would be that one. Source: The Guardian, “My Penalty Miss Cost Italy the World Cup?“, 19 May 2002. Taffarel, Jorginho, Branco, Aldair, Marcio Santos, Mauro Silva, Dunga, Mazinho, Bebeto, Zinho, Romario. Marcio Santos failed to convert. Pagliuca, Bennarivo, Maldini, Baresi, Mussi, Albertini, Baggio, D., Berti, Donadoni, Baggio, R., Massaro. R. Baggio failed to convert.